Fatty change can be focal ( Figure 1 , arrow; Figure 2 ) or diffuse ( Figure 3 , Figure 4 , Figure 5 , and Figure 6 ) and macrovesicular ( Figure 3 and Figure 4 ) or microvesicular ( Figure 5 and Figure 6 ). 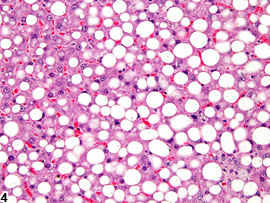 Macrovesicular fatty change is often associated with metabolic disturbances and is generally readily reversible, whereas microvesicular fatty change is more likely a reflection of toxicity, possibly involving mitochondrial disturbances. 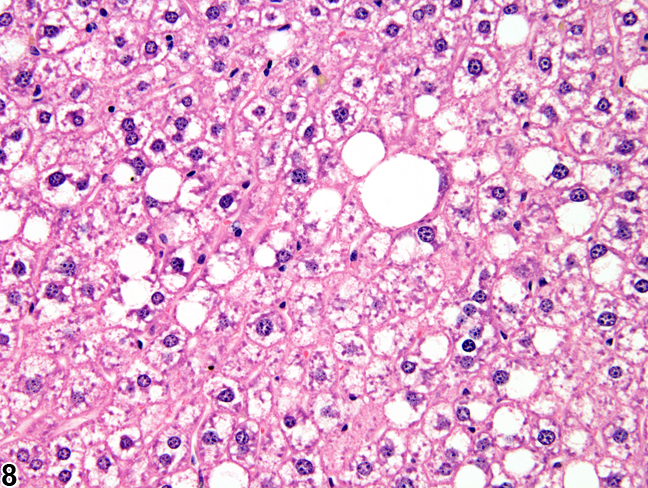 Figures Figure 1 and Figure 2 represent a focal lesion in which the morphologic features of the vacuolated hepatocytes are consistent with both macrovesicular and microvesicular fatty change. Focal fatty change can be a spontaneous lesion and may be more common in some strains than others, whereas diffuse or zonal (e.g., centrilobular or periportal) fatty change is more likely to be treatment related. 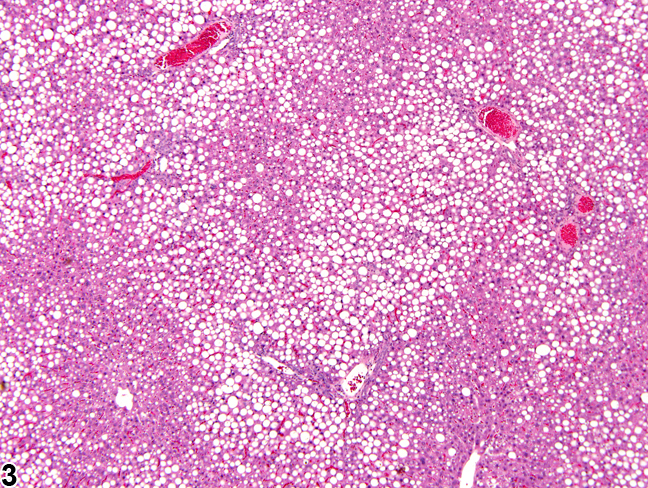 The cytoplasmic vacuolization in Figures Figure 3 and Figure 4 is diffuse and consists of both large and small single or double cytoplasmic vacuoles within hepatocytes. 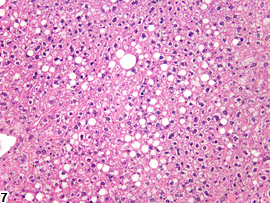 The morphologic features are consistent with macrovesicular fatty change, with compression and displacement of the nuclei to the periphery of affected hepatocytes. 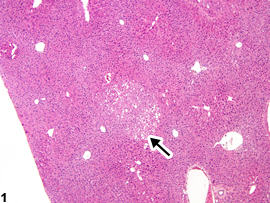 In contrast, Figure 5 and Figure 6 are representative of microvesicular fatty change, with a more prominent response in periportal and midlobular areas. 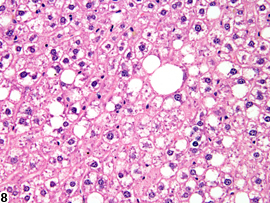 The cytoplasmic change consists of multiple small vacuoles filling the cytoplasm without prominent compression or displacement of hepatocyte nuclei. 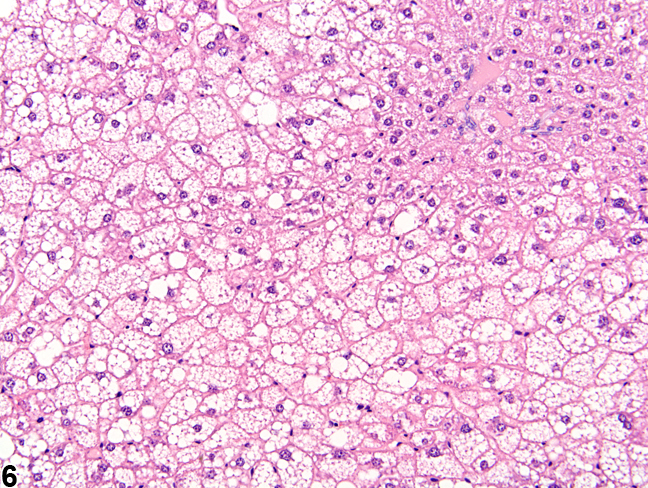 Sinusoids may be collapsed by the hypertrophic hepatocytes. 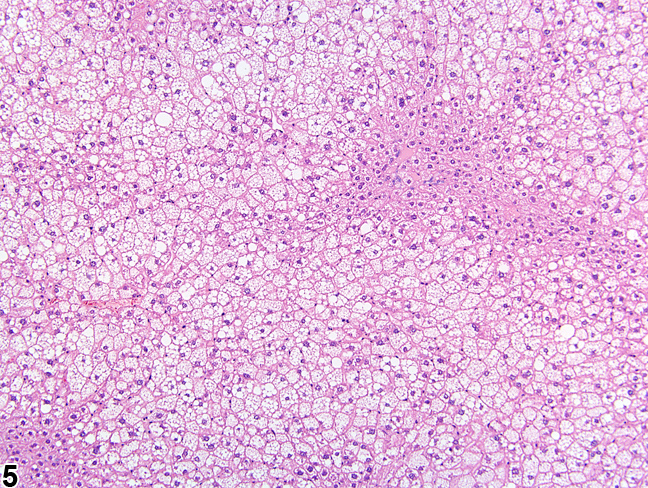 Figure 7 and Figure 8 represent a mixture of both macrovesicular fatty change and glycogen accumulation in hepatocytes. 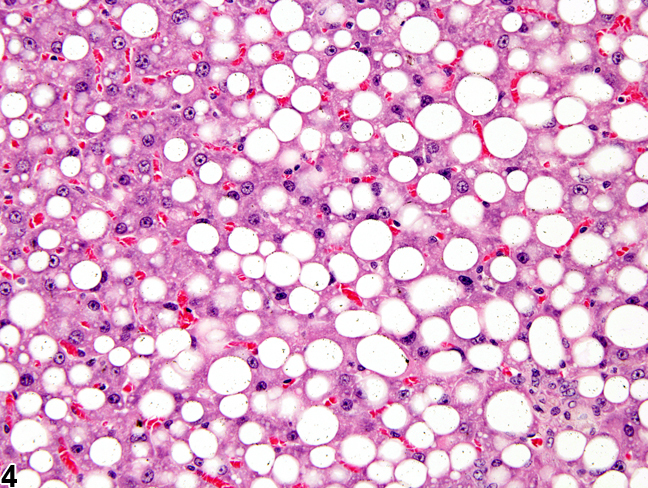 Mixtures of glycogen and both macrovesicular and microvesicular fatty change may be seen. 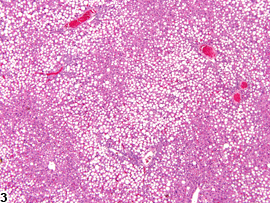 Phospholipidosis is another form of hepatocyte cytoplasmic vacuolization that is associated with exposure to cationic amphophilic xenobiotics and requires special staining and/or electron microscopy for definitive confirmation. 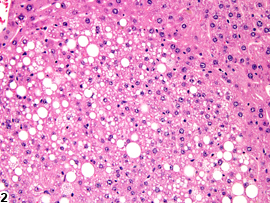 The morphologic appearance of fatty change is distinctive enough to allow its diagnosis in the absence of confirmatory special stains or other procedures. 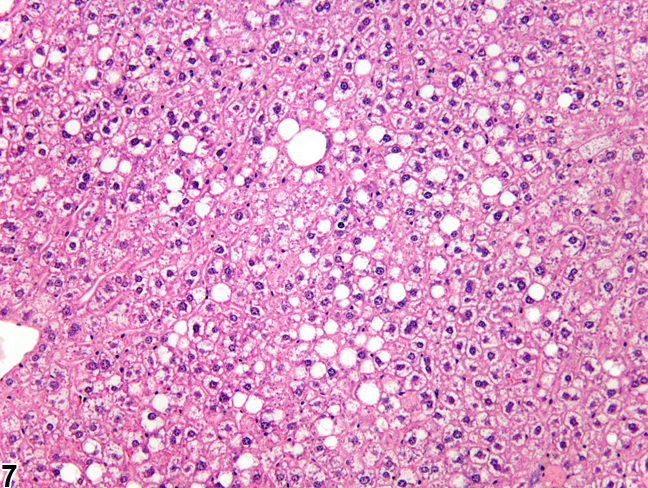 Whenever present, diagnosis of hepatocellular fatty change should be recorded. Since some degree of fatty change may occur in untreated or vehicle controls, severity grading is recommended to document potential treatment-related effects. Because focal fatty change may be spontaneous, the distribution modifier “focal” should be included in the diagnosis when the lesion is focal. When the lesion is diffuse, no distribution modifier should be used (i.e., the lesion is assumed to be diffuse when the distribution is not specified in the diagnosis). 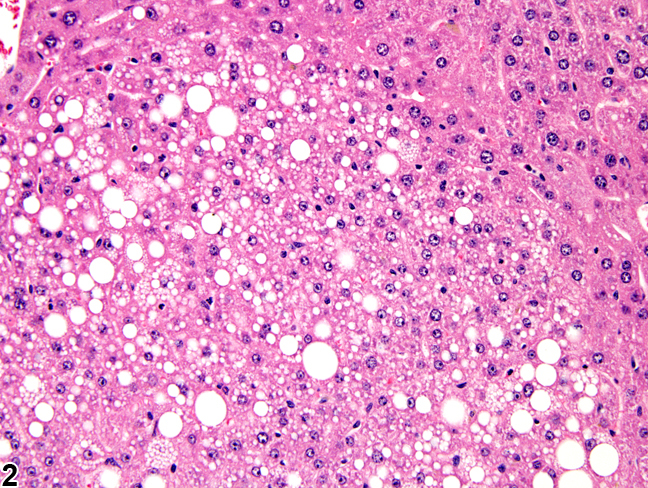 The morphologic features of the fatty change (e.g., macrovesicular, microvesicular, or both) should be described in the pathology narrative. Other distinctive features, such as the pattern of distribution, should also be described in the pathology narrative. 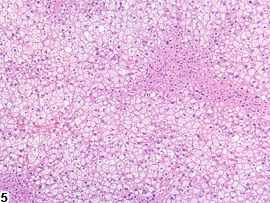 Fatty change is frequently accompanied by other cytoplasmic alterations, such as glycogen accumulation or depletion, and it can be difficult to distinguish the different types of alterations in cytoplasmic morphology. In those situations, a diagnosis of hepatocyte cytoplasmic vacuolization is appropriate, along with a severity grade, but the morphology of the cytoplasmic changes in the hepatocytes should be thoroughly described in the pathology narrative. The pathology narrative should also include the pathologist’s opinions regarding the contents of the cytoplasmic vacuoles.